Week 1 of the 2016 College Football season will have fans glued to the couch all weekend long, and several marquee matchups are on tap over the next five days. On Saturday, defending national champion Alabama will take on USC in the 2016 edition of the Advocare Classic at AT&T Stadium. With the nation getting its first taste of the Tide this season, the game will serve as the top-priced matchup of the week. Georgia vs. North Carolina, Wisconsin vs. LSU, FSU vs. Ole Miss and Auburn vs. Clemson also appear on this week's top games list. Check out the complete list of most expensive Week 1 CFB games below. All data is courtesy of TicketIQ, the leading online ticket aggregator that pools both primary and secondary market brokers to give consumers the largest access to inventory. Alabama will be tested right out of the gate as they take on USC in Dallas on Saturday. Nick Saban and Co. enter the season ranked No. 1 on the AP Poll, and they'll look to start their season with a bang over the rising Trojans, who keep all but starting QB Cody Kessler intact in 2016. The matchup leads the way on the secondary market this week, as Alabama tickets on TicketIQ currently own a $437 average against USC. If looking just to get past the gates at AT&T Stadium, the cheapest tickets are listed from $159 each. Early Thursday morning saw news break that Georgia will start QB Greyson Allen against North Carolina in their opening game at Georgia Dome on Saturday. Saturday's game will be the second most expensive of the week, and that big resale ticket demand is likely due to the hosting location. Georgia Dome will close following the 2016 season and just four college football games are scheduled there over the next four months. Georgia tickets at Georgia Dome now own an average resale price of $355 and the get-in price to Saturday's game is $176. The Wisconsin Badgers will open their season in grand fashion as they set to host LSU at Lambeau Field on Saturday. 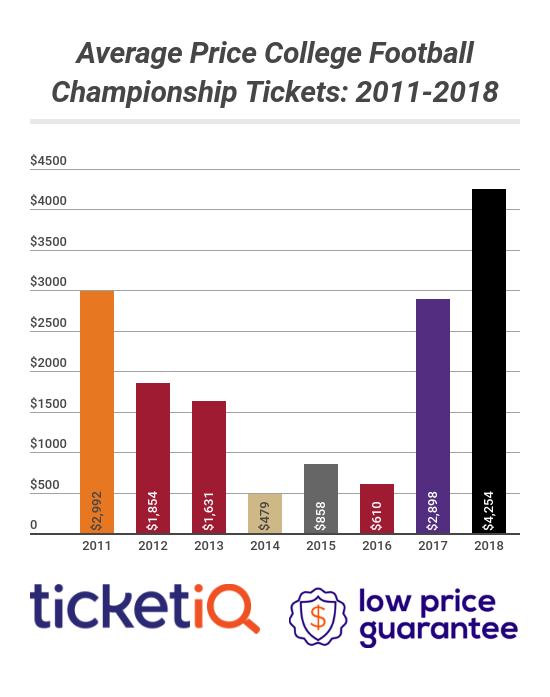 The game will serve as the first college matchup at Lambeau in 33 years, which is undoubtedly causing a massive spike in prices on the secondary ticket market. As it stands now the average price for Wisconsin vs. LSU tickets is $269. The cheapest ticket is $153. More than 80,000 people are expected to be on hand in Green Bay for the milestone game. The last game to be held there came in November 1983, when St. Norbert took down Fordham with just 842 fans watching. Heading down south, the first annual Camping World Kickoff Game will feature FSU and Ole Miss battling at Orlando's Camping World Stadium on Labor Day. Both teams are expected to make noise in their respective conferences, and with playoff expectations filling both sides of the field, it comes as no surprise that Monday's game is carrying big ticket demand. Florida State tickets against Ole Miss currently average $205 and the get-in price at Camping World Stadium starts from $56. Clemson was near-perfect last season, racking up wins each week leading up to their title game with Alabama. One historic onside kick later, and the Tigers will hope to avenge their crushing loss to the Tide with another massive season in 2016. They'll be tested early, however, with a Week 1 matchup on the road against perennial SEC threat Auburn. Clemson tickets on the secondary market during Week 1 currently average $178 and the cheapest ticket is listed from $89.